Our zesty Italian blend creates a melody of fragrance and flavor to what is commonly known as a typical pizza and pasta seasoning. Our perfect combination of herbs and spices is a flavorful delight, sure to please the palate and enhance any homemade dish. Use this blend in pasta sauces, marinades, and soups. Sprinkle on garlic bread and croutons. Excellent in sautéed mushrooms and stuffed artichokes. Mix with vinaigrette salad dressings for a unique flavor. 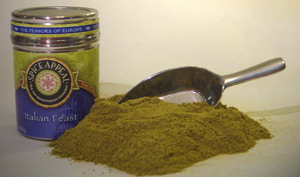 This tasty spice blend includes oregano, marjoram, rosemary, basil, sage, and a variety of other spices.